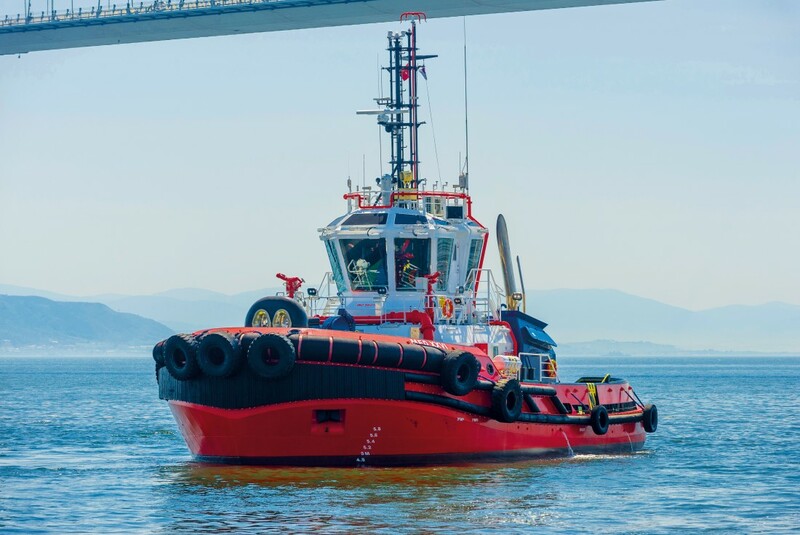 Turkey’s leading tugboat operator and shipbuilder Med Marine has delivered another tugboat to Gemport for its operations at Gemlik Port. Med Marine recently delivered an 18m conventional tugboat to Gemport. Gemport belongs to Yıldırım Group of Companies’ subsidiary Yılport Holding, which operates 21 terminals in 9 countries besides having a global presence in 9 different sectors in 51 countries. The vessel is a Robert Allan Design RAmparts 2300-MM tugboat, designed exclusively for Med Marine. It was being operated in Med Marine’s fleet and was known as MED XXVI. She is renamed as Uludağ Y.
ASD type high-quality vessel is designed for harbour and terminal operations, and coastal towing. She has the length of 23.00m, the beam of 10.90m and the depth of 4.4m. A pair of powerful Caterpillar 3512C diesel engines develops a total output of 2 x 1.380 bkW at 1.600 rpm with a free sailing speed of 12.0 knots and bollard pull of 50 tons. Two Caterpillar C4.4 gensets provide total 2 x 86 ekW electrical power for vessel services, including the deck machinery. She drives two Schottel SRP340 azimuthing thrusters with fixed pitch propellers of 2,100 mm diameter. Diesel-driven fire-fighting (FiFi) pump for the tug’s FiFi system is driven from main engines and can deliver 1,400 m3/h to two electrically controlled monitors. An electric frequency controlled towing winch, a (split) towing drum, a warping head and an electric anchor capstan to suit a 20,5* mm studlink chain with quality U2 are supplied from THR Marine. The fore towing winch is custom made for Med Marine with a pulling force of 300kN and brake holding force of 1300kN. The RAmparts 2300-MM class tugs are compliant with the Maritime Labour Convention (MLC) with high-quality and great-comfort accommodation, a captain’s cabin, an officer cabin and two double crew cabins. Remaining five identical sisters are being operated in Med Marine’s own fleet at different locations in Turkey.